His Excellency Mr. Karim Kawar was Jordanian Ambassador to the United States from 2002 to 2007. He currently holds senior positions as President of Kawar Group, and Chairman of IrisGuard, NatHealth, and Kawar Energy. He is co-founder and Director of Oasis 500, and serves on the boards of pubic shareholding companies Optimiza, Ahli Bank, United Insurance, and JWICO. His Excellency is also the Chairman of the Board of Trustees of King’s Academy, President of Bridges of Understanding, and Founding Chairman of EDAMA Initiative for Sustainable Energy, Water, and Environment. Furthermore, he is Trustee of the King Abdullah II Fund for Development, the Jordan River Foundation, and the Jordan Strategy Forum. 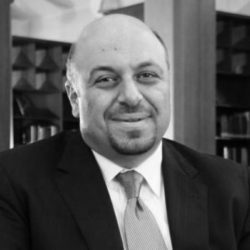 He is also the architect of the REACH Initiative and Founding Chairman of Information Technology Association of Jordan Int@j.
Mr. Karim Kawar holds a Bac degreehelor’s in Management Finance and Computer Science from Boston College, and is a former Young Global Leader and an Eisenhower Fellow.